Tinsons Barn at Village Farm Cottages in Bolton, near York, Yorkshire sleeps 4 people. Village Farm Cottages near York are peacefully located in the village of Bolton, at the foot of the Yorkshire Wolds; Village Farm Cottages are perfectly placed for walking, cycling or driving holidays, and Classic Car Hire Yorkshire is based on site. Tinson’s Barn (ref UK2357) is almost 300 years old and oozes quirky charm with its mix of traditional design and contemporary convenience. 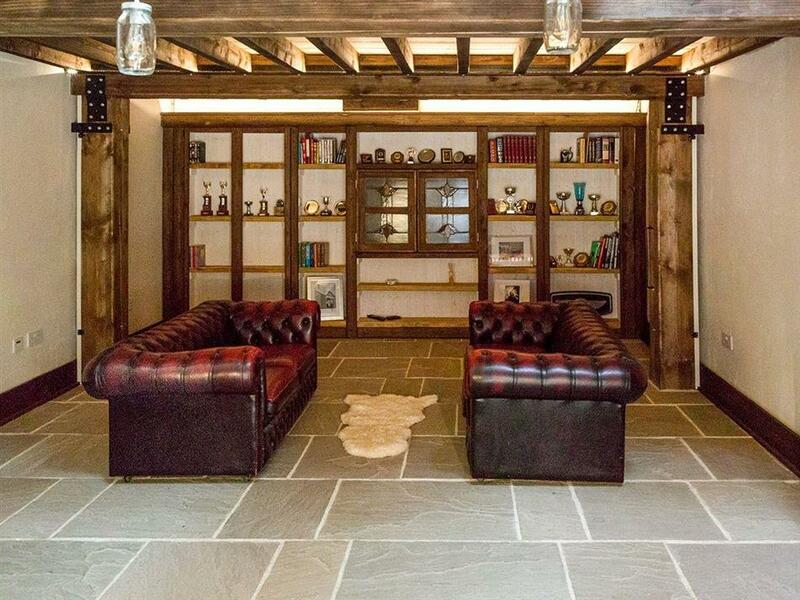 It has stone floors throughout the ground floor with reclaimed Victorian floorboards upstairs. The landing has a glass floor, spilling light onto the dining area below. The spacious open plan living area with solid oak dining table and two Chesterfield sofas is ideal for relaxing, watching television or listening to your own music through the Bluetooth sound bar. There is a stylish kitchen with black lacquer cabinets and polished black granite worktops. Both bedrooms are interesting and very comfortable, one with a Yorkshire Box-bed complete with heavy tapestry curtains and the other bedroom has a French farmhouse bed. There are slipper baths in each bedroom and separate en-suite toilets and washbasins. The Garden Rooms (ref UK2356 [The Garden Rooms]) is ideal for couples, with a spacious open plan living area and a cosy bedroom, also with a bath and en-suite toilet and washbasin. Less than half a mile away in the village of Fangfoss is a traditional country pub serving great food and real ales, and the market town of Pocklington 2½ miles away, offers a selection of shops, inns and restaurants, as well as the famous ‘Oak House’ which operates as a cinema, theatre and live music venue. Close by are the Burnby Hall Gardens, the Yorkshire Air Museum and the Museum of Farming. The historic walled city of York is just half an hour’s drive, with easy access from Grimston Bar park and ride. York offers all year round appeal with world-renowned attractions including the iconic Minster, Railway Museum and Jorvik Centre. There are art galleries and theatres, festivals and street entertainers, and a wide variety of shops, restaurants and traditional tearooms. Out of town shopping can be found at The Designer Outlet, Vangarde, Monks Cross and Clifton Moor. Explore the surrounding area with a drive through the gentle undulating hills of the Yorkshire Wolds countryside which inspired the famous artwork of David Hockney. Visit the coastal resorts of Bridlington, Filey and Scarborough. The North York Moors and the Yorkshire Dales are easily accessible. The shop is 2½ miles from Village Farm Cottages near York, with the pub and restaurant ½ mile from Village Farm Cottages. Tinson’s Barn can be booked together with The Garden Rooms (UK2356) to sleep up to 6 people. Ground Floor at Tinsons Barn: Living/dining room: With 52 Freeview Smart TV, Bluetooth sound bar and stone floor. Kitchen: With electric oven, electric hob, combi microwave/oven/grill, fridge and freezer. First Floor: Bedroom 1: With double bed, slipper bath and en-suite toilet. Bedroom 2: With double bed (access from one side only), slipper bath and en-suite toilet. Biomass central heating (underfloor on ground floor), electricity, bed linen, towels and Wi-Fi included. Utility room with washing machine and tumble dryer (shared with other property on-site). Enclosed courtyard with garden furniture and chiminea. Hot tub for 5 (private). Private parking for 2 cars. No smoking. Holidays at Tinsons Barn, Village Farm Cottages run from Monday to Monday. For a better idea of where Village Farm Cottages - Tinsons Barn is, you can see Village Farm Cottages - Tinsons Barn on the map below. 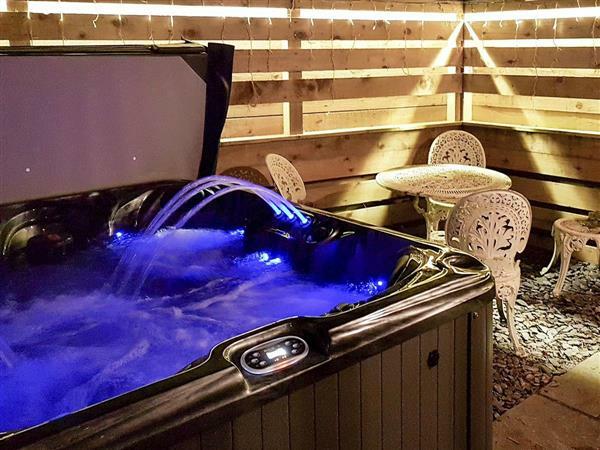 Village Farm Cottages - Tinsons Barn is in North Yorkshire; should you be on the lookout for a special offer, you can find all the special offers in North Yorkshire. It's always worth checking to see what is on offer at the moment. Do you want to holiday near Village Farm Cottages - Tinsons Barn (UK2357), you can see other cottages within 25 miles of Village Farm Cottages - Tinsons Barn; have a look to find your perfect holiday location.